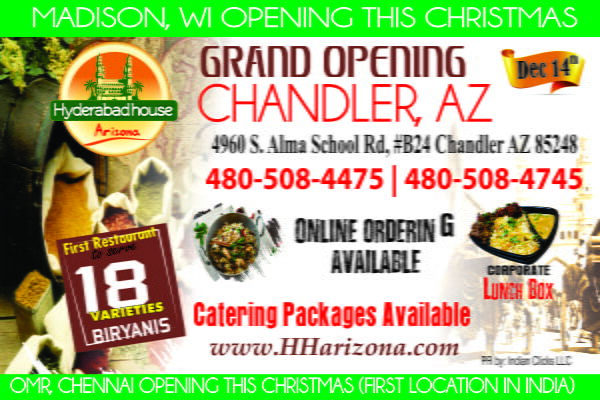 “Nawabi Hyderabad House Biryani Place” is extremely delighted to bring our hospitality to the Valley of Sun as HYDERABAD HOUSE, Arizona. Above all else, a huge thanks from ‘Nawabi Hyderabad House Biryani Place’ staff and management for an overwhelming response and a warm Welcome to Arizona. The diversified menu infuses new commendable recipes and authentic flavors that embraces Hyderabad House’s famed Dum Biryanis, Curry Leaf Chicken, Monagadi Kodi Vepudu, Cashew Chicken, Ulavacharu Kodi Vepudu, Palnadu Mamsam vepudu, Avakai Chicken Biryani, Gongura Chicken Biryani, Vijayawada Chicken Biryani, Ulavacharu Biryani, and Rajugari Kodi Pulav are few of the many which are easily accessible for Indian diaspora in the vicinity. While you are there, don’t forget to inquire about our catering specials and Banquet Hall which are tailor-made and on demand. In their own words from franchisees – Franchisors Siva Yarlagadda and Vamsi Kallepalli have been of great support and made the progress seamless and dependable for the future. Nawabi Hyderabad House has been and continues to be dedicated to the promotion of our Fine Indian Cuisine Culture to a wider audience.